Originally named Munchen (III), this ship was built for NDL by Vulkan of Stettin. Launched in 1922, she made her maiden voyage from Bremen to New York on 21 June 1923. On 11 February 1930, while at New York, Munchen was badly damaged by fire and sank in the Hudson River. After being refloated, she underwent temporary repairs in Brooklyn, and returned home in May. She was then rebuilt, converted from coal to oil fuel, and renamed General von Steuben, before returning to Bremen-New York service in February 1931. She made her last voyage on that service in November 1934. From 1935 on, she was used only for cruising. 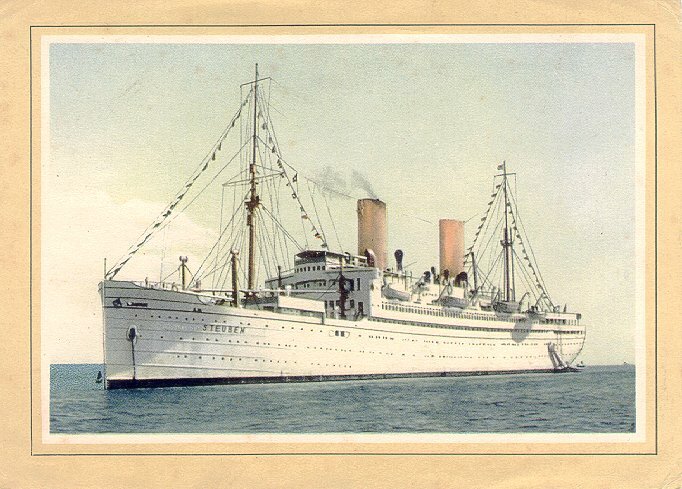 Renamed Steuben in 1938, she was converted into a German Navy accommodation ship in 1939. As the war drew to a close, Steuben, like many other German ships, was pressed into service to evacuate troops and civilians from the Eastern Front. On 9 February 1945, Steuben left Baltiysk, Russia, bound for Kiel, Germany, with 2,500 wounded soldiers, 2,000 refugees and a crew of 450. On 10 February, shortly before midnight, she was torpedoed twice by the Soviet submarine S.13 and sank with the loss of about 3,000 lives.